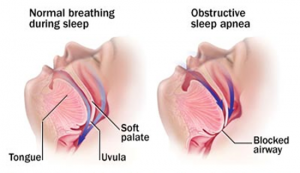 Obstructive Sleep apnea is a condition in which your breathing stops periodically during sleep – creating an absence of airflow despite respiratory effort. It is usually due to upper airway collapse. Each time you stop breathing in your sleep, the resulting lack of oxygen alerts your brain, which temporarily wakes you up to restart proper breathing. Since the time spent awake is so brief, most people with obstructive sleep apnea don’t remember it, and many believe they are getting a good night’s sleep when, in fact, they are not. The constant wake-sleep, wake-sleep cycle prevents those with sleep apnea from achieving deep sleep, resulting in a constant drowsy feeling during the day.